Back in early June my daughter treated me to a three day class with an artist whose work I've been admiring and following for some time--Elizabeth St. Hilaire-Nelson. You can follow her blog here--you'll be amazed by her creativity. And did I say she competed in a triatholon the day before our class? Amazing energy. Anyway, my daughter drove from Connecticut and I drove up from Pennsylvania and we met in Penn Yan, NY where the class was held. It was sponsored by the Art Center of Yates County. 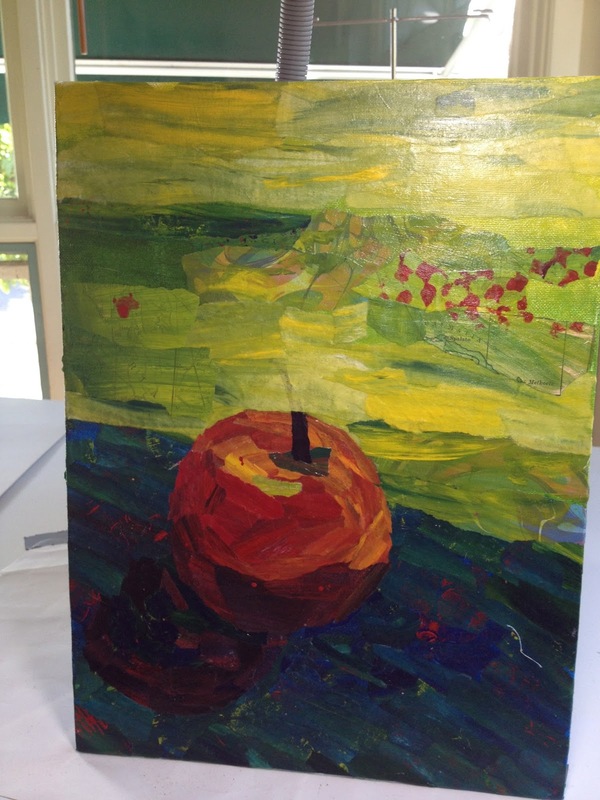 We had to come with a painting of an apple or a pear that we had prepared before class. Then we began painting any and all kinds of papers. Some of the students had been to the class the previous year and they brought along many different kinds of papers that they had collected during the year, some already painted and some which they painted during the class. Each was to bring a sketch of the subject they wanted to work on. I chose one of my favorite subjects--the chameleon. You might remember that I did a chameleon in a workshop with Susan Carlson about two years ago. Seems I have a reptile thing going. Anyway, here are my two completed projects. Fortunately one of the students had the perfect paper for the head of the chameleon which she generously shared. If you ever have a chance to take a class with Elizabeth, don't hesitate. 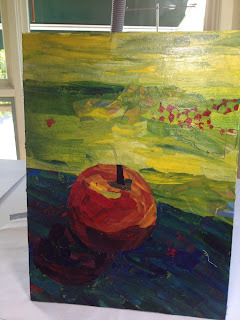 She recently shared a photo on her blog of part of an old fence that she'd done some paper painting on. Since then I've been searching flea markets and yard sales for some old fence but have not met with any success yet. How To Release Your Inner Happy . . .